The planned five-day hearing of the appeal was adjourned on Monday amid uncertainty over his testimony. The two men, John Paul Wootton and Brendan McConville, were convicted last year by a juryless court of the shooting of a PSNI man in the north Armagh town in March 2009. The development came as another prominent prisoner, Brian Shivers, was separately acquitted on Friday. Shivers was finally cleared following a retrial brought by prosecutors after his conviction in the ‘Real IRA’ Massereene case, which also took place in March 2009, was quashed on appeal. The appeal court heard today that a new witness in the Craigavon case was held for two days last week after the PSNI forced their way into his home and warned him against appearing in court. Defence lawyers said they would lodge a complaint with the police ombudsman’s office. The convictions last year of the ‘Craigavon Two’ was immediately controversial after prosecutors admitted that electronic surveillance data, presented as key forensic evidence, had been tampered with by British Army experts. Wootton, a teenager at the time of the incident, received a minimum 14-year term. McConville is serving at least a 25-year sentence for the murder. Justice activists, campaigners, friends and family had packed the Court of Appeal on Monday for the planned opening of their challenge. 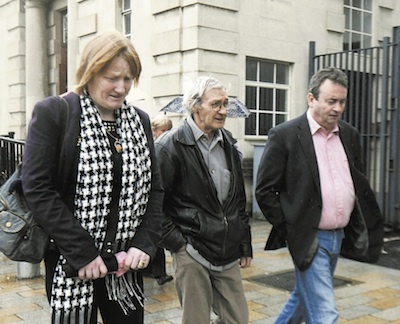 Among those present in the public gallery were Paddy Hill of the Birmingham Six and Gerry Conlon of the Guildford Four, both victims of well-known British miscarriages of justice. But instead they heard prosecution counsel Ciaran Murphy seek an adjournment of several months. McConville’s barrister Barry Macdonald stressed that the prosecution case was based entirely on circumstantial evidence, primarily from a man identified only as witness ‘M’ who claimed to have seen McConville in the area at the time of the killing. Earlier this month a relative of witness ‘M’ who did not testify at the trial gave an affidavit branding him a compulsive liar, the court heard. Mr Macdonald said the affidavit stated that “he was known in the family as a Walter Mitty, that he made up stories, that he had a fertile imagination and you could not believe anything he said”. According to the relative, witness ‘M’ could not have taken the route he claimed to have taken on the night of the murder. But Mr Macdonald told the court that last Monday the PSNI called at the house of this witness, forced their way into the house and proceeded to warn him that if he went to court, he would be discredited. The three appeal judges were informed that letters of complaint were to be sent to Crown Prosecutors and the Law Society amid concerns that covert surveillance might have been used against the witness. Mr Macdonald described the PSNI intervention as an attempt to ‘sabotage’ the appeal. He said the PSNI had moved to arrest the new witness “and to subject him to... improper pressure.. with a view to securing the withdrawal of his evidence and therefore undermining the appeal”. Defence teams would have no faith in the PSNI ‘investigations’ because of the conflict of interest, he added. But despite objections, it was confirmed that the hearing would be postponed until October. A County Antrim councillor who belongs to the ‘Justice for the Craigavon Two’ campaign group said afterwards she believes she may have been put under police surveillance because of her concerns over the case. Anita Cavlan, a former Sinn Fein councillor, said she became alarmed after it emerged she was being watched. “Everything I am doing is above board and perfectly legal and, as we know from previous incidents, people can be fitted up to try to put them off being involved in justice campaigns,” she said. A statement from the ‘Justice for the Craigavon Two’ campaign group said there had been a “a sense of disbelief” in the opening moments of the hearing after an immediate adjournment was requested. They said the arrest of the new witness “indicates the lack of factual evidential information surrounding this case -- rather it is a case built upon the dubious practices of covert agents and surveillance. “This practice has now been extended to the defendants’ legal team, family members and members of the Craigavon Two campaign committee, who it has now been revealed were subjected to a covert surveillance and recording operation. They called for the two men to be released on bail “pending the withdrawal of what has now become a farcical and unsustainable conviction”. A lawyer acting for Brendan McConville has called for an independent body to look at the PSNI’s actions. Kevin Winters said he had also asked Crown prosecutors to confirm whether they had urged the PSNI to arrest the potential witness. “We have concerns and they were highlighted in court about the manner in which the police have approached this and have written to the police ombudsman and in the strongest terms voiced our grave concerns,” he said.